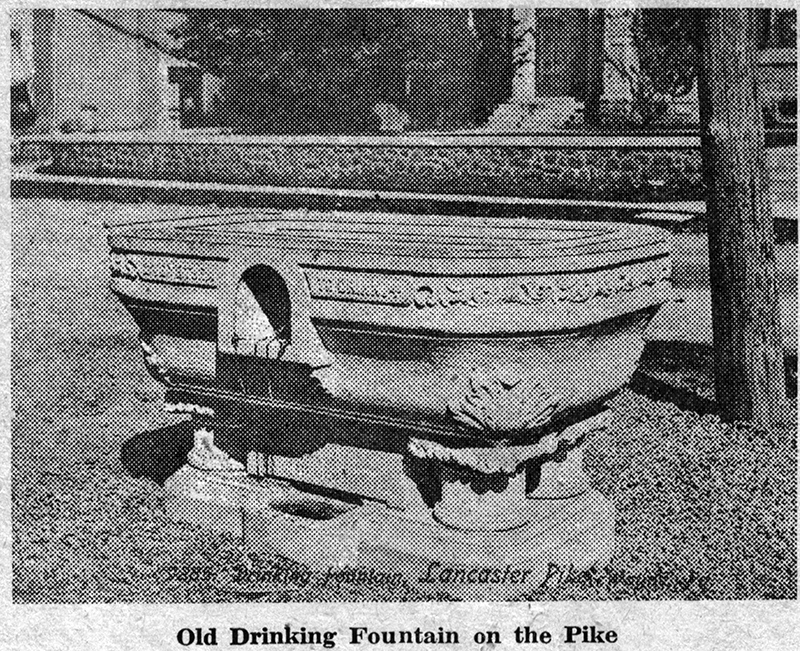 Following printing of a picture of Wayne’s “Wayside Drinking Fountain” in the November 8 issue of this column, the writer received several communications in regard to it. With a bit of information picked up from each, a considerable amount has been added. Several people remembered that the fountain was a gift to the community from the Women’s Christian Temperance Union of Wayne. The fountain stood directly in front of the present Wack Pharmacy, then owned and operated by Dr. H.C. Hadley. It was moved from its site on Lancaster Pike more than 30 years ago, probably in the 1920’s. One story goes that the members of the Board of Commissioners, whose duty it was to see that the water pipes to the fountain were disconnected in the early fall, forgot to have the job done. In consequence the pipes froze and the fountain split. The matter was referred to the Board, and the old fountain was ordered to be hauled away. Apparently this was to parts unknown, as all trace of the fountain’s history seems to be lost from that point on. Another report states that it was badly cracked by various wagons that bumped into it as their drivers rumbled along the Pike, or stopped to water their horses. Up to this point, information had dealt mostly in generalities. But one day, in the course of Christmas shopping for her grandchildren, the writer stopped at Halligan’s, where Jack Scherr, its proprietor, remembered many things in connection with the old fountain. He could call by name many contemporaries who hung around the fountain in their younger days, or who sat on the stone wall of the Wayne Presbyterian Church, directly opposite. One of their favorite winter pastimes, it seems, was to make snowballs and to try to hit the church steeple with them! Occasionally they were successful, more often not. In milder weather, a favorite sport was to throw each other in the fountain – one that probably did not end until each youngster had been properly dunked! To prove that wayside drinking fountains are not entirely a thing of the past, your columnist received a letter from Mrs. R.I. Heim, Jr., of Bloomingdale avenue, which says in part, “Many a time our horses stopped at Wayside watering fountains and they knew just where they were. They needed no pull on the rein to turn to one side…” Then Mrs. Heim goes on to tell that only that week the old drinking fountain where Lancaster avenue meets Market street, near 32d, Philadelphia, had been removed. This was in preparation for rerouting traffic while Chestnut street bridge is being rebuilt. There are a number of commission houses along Market street and every day hucksters would stop at that fountain to water the horses. The names of the presidents during the first ten years of the Saturday Club’s existence were given in this column in the October 11 issue. During the next ten years, 1896-1906, which were important ones because of the building of the clubhouse, presidents were Mrs. W.B. McKellar, Mrs. George Miles Wells, Mrs. C. W. Ruschenberger, Mrs. Ralston C. Ware, Mrs. Ellis L. Campbell, Mrs. William A. Nichols and Mrs. Clarke J. Wood. Probably the most important event of the 1906-1916 period was the 12th annual convention of the State Federation of Pennsylvania Club Women, held at the Devon Inn, with the Saturday Club as host club. Some 400 women were in attendance, coming to Devon from all sections of Pennsylvania. And what were the clubwomen discussing at this time? These were the topics of some of their convention addresses: “Child Labor Regulation in Pennsylvania,” “Home Economics as an Educational Phase in Civics,” “The Movement Towards Civic Beauty” and “Moral Training in Public Schools.” Mrs. Edward W. Biddle of Carlisle, who was to succeed Mrs. Ellis Lewis Campbell as state president, was much interested in education in Pennsylvania. She felt that school taxation was quite inadequate to introduce manual training, school libraries and many other adjuncts, such as schools in neighboring states enjoyed at that time. Mrs. Henry Roever’s presidency, beginning in 1914, was succeeded by that of Mrs. Marshall H. Smith, Mrs. W. Allen Barr, Mrs. John J. Mitchell, Jr., Mrs. Walter H. Dance and Mrs. Charles H. Howson. This was the period of World War I. Just before Christmas, 1917, the hospitality of the club was extended to 25 marines from the Philadelphia Navy Yard, with senior members of the club cooperating with the Junior Saturday Club. There were canteen luncheons and service days at the club house, when members were urged to bring any work they might be doing for men at the front. There was a vaudeville show, put on by the juniors for the benefit of a Fund for French Orphans. 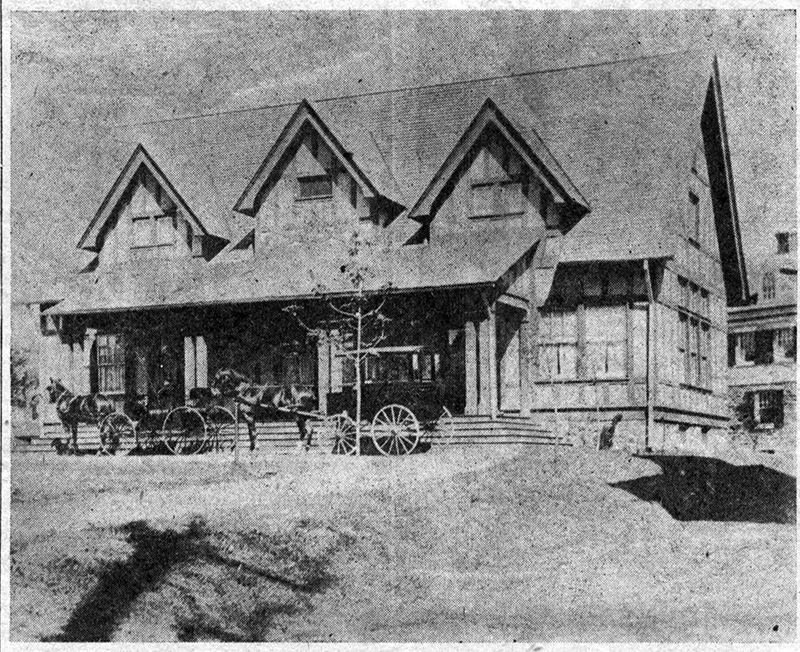 At the end of February, 1918, the club house was closed by the coal shortage, not to be reopened until April, and meetings were held at the homes of various members. At the end of April, as a response to a request from the Government, a “War Kitchen” was held in the club house for a short period of time. During the influenza epidemic the building was turned into a hospital for those who could not gain admittance to regular hospitals. In November, 1918, came the Armistice and, with it, happier days in the life of the club. Presidents of the 1928-1956 period were Mrs. Henry Roever, Mrs. Frederick A. McCord, Mrs. E. Earl Trout, Mrs. Paul Gant, Mrs. T. Magill Patterson (two terms of office), Mrs. H.H. Kynett, Mrs. F. Ashby Wallace, Mrs. J. Stewart Freeman, Mrs. A.E. Livingston, Mrs. Richard Howson, Mrs. J. Russell Hogeland, Mrs. Spencer V. Smith, Mrs. J. Leroy Vosburg and Mrs. G. Rushton Howell, the present incumbent. In closing today’s “Your Town and My Town,” your columnist would like to call the attention of her readers to the fact that those “social, bright, congenial women” who gathered in Mrs. Sayen’s parlor in the early winter of 1886 to discuss “the subject of women’s clubs – then almost a tabooed one” started a local organization that now numbers some 300 members. These women are active in the Saturday Club in more than 30 divisions of women’s club activities as organized by the General Federation of Women’s Clubs and the Pennsylvania State Federation. The former is the largest and most powerful organized group of women in the world today, yet the Saturday Club outdates the formation of that great organization by some four years! It was on October 17, 1898, that the then current Board of the Saturday Club authorized its president and secretary to sign a contract with J.D. Lengel, of Wayne, for erection of a club house on a lot on West Wayne avenue, purchased from the Wayne Estate. The report of Mrs. Ralston C. Ware, chairman of the building committee, is still among the club’s most treasured documents. It would seem, as one reads it, as if she were giving the report in person. She tells of the many meetings of the committee with the architect, David Knickerbacker Boyd, a resident of Wayne, who at the turn of the century was one of Philadelphia’s best known architects. It was with great pride that Mrs. Ware and the two members of her committee made their final report, for in it they stated, “We look forward to our club house as being a rallying place for our members, which will lend a special interest and impetus to all our work, literary and social.” The total cost, including the purchase price of the land, was recorded down to the very penny by Mrs. Ware as $5,145.08! No additions or alterations of any consequences were made to this original structure until June, 1912, when Mrs. Parke Schock served as chairman of a new building committee, during the presidency of Mrs. Marshall H. Smith. At that time, changes and additions were made in the basement to provide a dining room, as well as the ground floor addition which forms the present stage. It is interesting to know that up to this time, long seats which extended across the east end of the main assembly room unfolded to form a stage. And how did Wayne itself look in those early days of the Saturday Club’s history? Lancaster avenue was then “Lancaster pike,” a narrow tree-shaded road with toll gate houses at close intervals along it. All vehicles were horse drawn, from the farmer’s wagon to milady’s elegant Victoria with coachman and footman. Bicycling was at its height, with “the ordinary,” as those with the high front wheels were called, just giving away to the “safety,” the forerunner of our modern bicycle. There were hitching posts and livery stables along the pike. Much of the surrounding countryside was farmland, although by 1886 Wayne was beginning to look like a small town. There was an influx of Philadelphians each June seeking to escape the heat of the city. With their children and nurses, their carriages and coachmen, they led a life of luxurious ease at the beautiful old Bellevue Hotel, on East Lancaster avenue, built in 1881 by George W. Childs, and at the impressive Louella Mansions, built even earlier by one of Wayne’s founders, Henry Askin. Other buildings already erected by 1886 were the old Opera House, now the Colonial Building; the Wayne Presbyterian Chapel, the original drug store owned by J.M. Fronefleld, on the site of the present Sun Ray store; Leinhardt’s Bakery, the original small building of the First Baptist Church, and the houses on Bloomingdale avenue. The old Cleaver Farm, by then occupied by the Hughs family, had long been a landmark. The Old Spread Eagle Inn was still standing. The swimming club was located at Kelly’s Dam, in North Wayne, near what is now Willow avenue. A “fire horn,” three feet long, was blown to man the “pumps” when there was a fire. 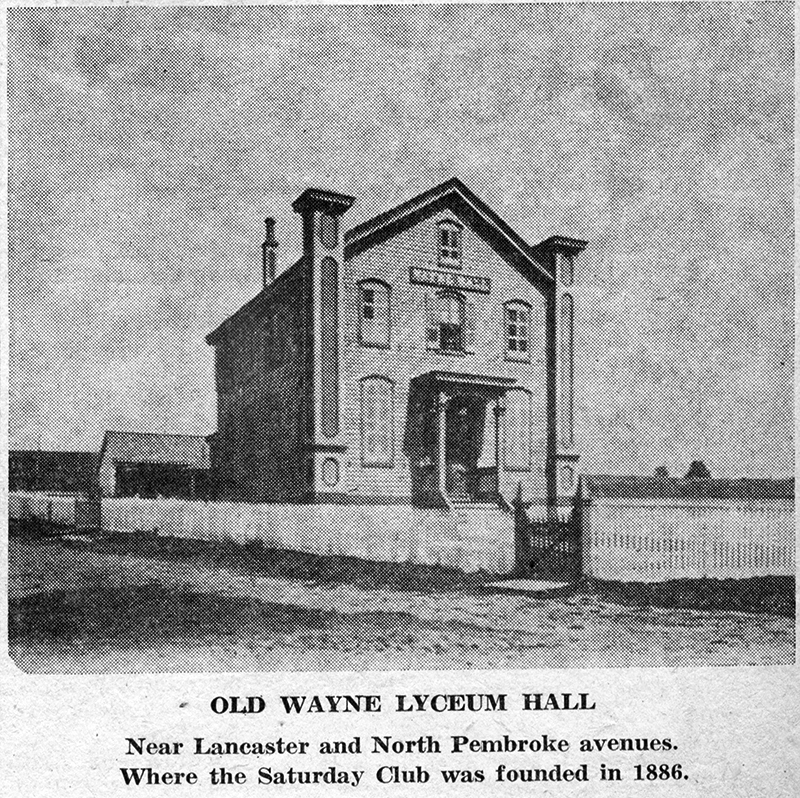 The Radnor Lyceum Hall, where the Saturday Club was founded, was a frame building, then located at the northeast corner of what is now Pembroke and East Lancaster avenues. When the Saturday Club of Wayne met last Tuesday afternoon (October 8), the guests for the annual Reciprocity Tea included presidents of all the other clubs of the Delaware County Federation of Women’s Clubs as well as the presidents of the Federated Clubs of the entire Main Line section. In addition to these two groups one other club was represented in this large gathering, the New Century Club of Philadelphia. It was so honored because, as told in last week’s column, it is the only woman’s departmental club in the entire state of Pennsylvania that antedates the Saturday Club of Wayne, having been founded in 1876 from the membership of the Women’s Committee of the Philadelphia Centennial. In October 1890, four years after its own founding, the Saturday Club was invited to send its president, Mrs. George R. Stocker, to an organization meeting of the General Federation of Women’s Club which was then in process of formation. A few months later, the Wayne club became one of the first members of that great Federation which is now the most powerful and influential group of organized women in the world. With its membership in the United States and its affiliated membership in foreign countries, this group now numbers more than six million women. The Saturday Club was also a founding member of the Pennsylvania State Federation of Women’s Clubs, when that Federation was organized in 1896 under the leadership of one of the Wayne Club’s early presidents, Mrs. Ellis Campbell. 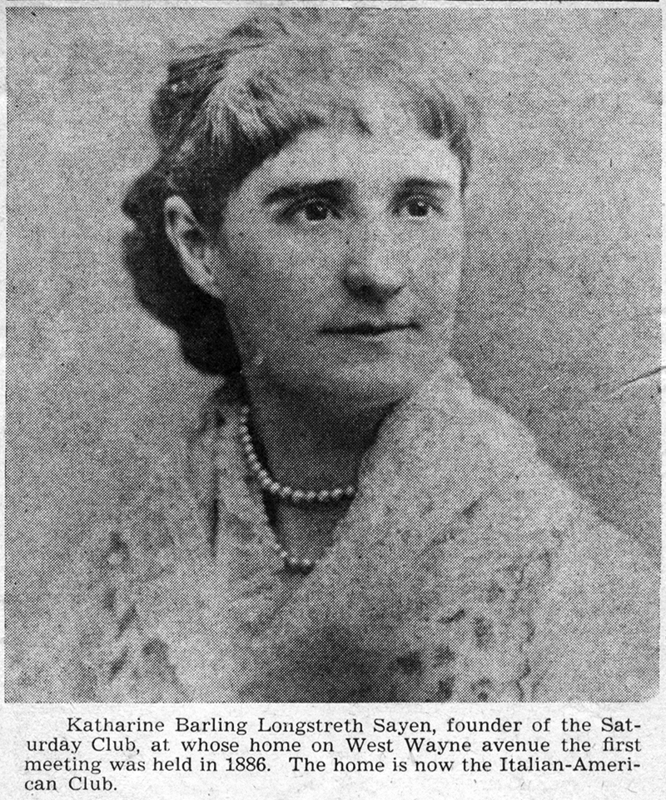 The latter, who had been president of the Saturday Club in 1892, served again in that capacity in 1903. Thus, the local woman’s club has been responsible, in a certain measure, for the founding of two organized groups of women, much larger in scope of activities and in membership than itself. It is interesting to quote part of Mrs. Stocker’s speech, delivered in June, 1891, when she assumed the presidency of the Saturday Club as the address indicates the vastly changed place of womankind in the life of today, from that of almost 70 years ago. “The Club movement for women,” Mrs. Stocker said in 1891, “is a factor for modern progress. It has stimulated an intellectual and social life without in the least detracting from the duties of wifehood and motherhood… It is impossible for men to comprehend the narrow groove in which the majority of women have been forced to live, move and have their being in the past. Presidents for the first ten years of the Saturday Club’s existence included Mrs. James Campbell, 1886-1887; Miss Anna H. Markley, 1887; Miss Buxton, 1887-1888; Mrs. George R. Stocker, 1888-1892; Mrs. Ellis L. Campbell, 1892; Mrs. Charles B. Stilwell, 1893; Mrs. Henry Birkimbine, 1893-1895, and then Mrs. Stilwell again in 1895-1897. With the opening of the Saturday Club of Wayne, on Tuesday, for its 71st season, it seems fitting to include in this column something of the history of the second oldest women’s departmental club in Pennsylvania. The local organization is second in age only to the New Century Club of Philadelphia, which was founded in 1876, soon after the close of the Centennial in Philadelphia. Among our readers there are many women so new to the community that they may not know that the structure just to the west of the Central Baptist Church building, on West Wayne avenue, is the home of the Saturday Club of Wayne. The faded ink of the first minute hook, one of the most cherished possessions of the club, recounts that “on February 16, 1886, at four in the afternoon, nine of the 12 ladies invited to be present met in the Library Room, Wayne Hall, where, after some informal remarks, Miss Markley was invited to preside.” The first order of business was the election of officers. Tellers announced the results of the balloting to be Mrs. James Campbell, for president; Miss Anna Markley and Mrs. P.W. Ver Planck, vice-presidents; Mrs. G.E. Abbott, secretary, and Miss Helen Erben for treasurer. The next order of business was a discussion of the meeting place for the new organization. 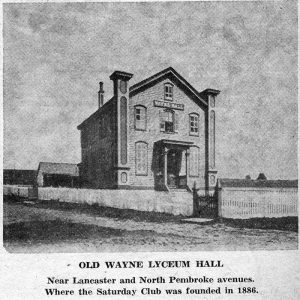 Although there was some opposition to the Wayne Hall, it was finally decided to meet there until a permanent organization should be formed in May. Dues were set at one dollar for the temporary organization and a committee of three, on constitution and by-laws, was appointed. The organizers made themselves a “committee of the whole” on entertainment. In addition to the officers, the other members of the original group of 12 were Mrs. William Henry Sayen, Miss Phillips, Miss Katharine Wentworth, Miss Simmons, Mrs. Barclay Johnson, Mrs. Peterson and Mrs. Henry Pleasants. A little later (to quote from the minute book), “there were nominated for membership six other ladies, all of whom gave great vitality to the infant club.” They were Miss Matlack, Mrs. Stocker, Mrs. Hughes, Mrs. E.L. Campbell, Miss Mary Rogers and Mrs. Fallon. The name “Saturday Club” was probably adopted because the men, and there were a few men members then, could attend. When members signified under which committee they wished to work, the results were “three under science, three under literary work, two under art and four under music.” At the meeting of March 27, the constitution and by-laws were adopted. The description of the informal meeting held before the first formal one is worth quoting. “On a snowy Saturday afternoon, there gathered in Mrs. Sayen’s parlor several bright, congenial women who, over steaming cups of tea, dared discuss the subject of women’s clubs, then almost a tabooed one.” Mrs. Sayen’s home still stands, now housing the Italian-American Club at the corner of West Wayne avenue and Conestoga road. At the annual meeting held in April, 1887, it was voted to reduce the regular dues from three dollars to two. However, “all men becoming life members pay three dollars and this gives them a membership for life.” Apparently not many availed themselves of this opportunity, for at a meeting held a year later it was moved “that the money be refunded to those gentlemen who have paid their dues for the year, and that those who have assisted us be elected honorary members.” It would seem that Dr. Egbert and Mr. Abbott had evidently been the only ones who had availed themselves of the opportunity to join the Saturday Club. The “Guide for the Pennsylvania Railroad,” printed in 1855, not only lists all these stations, but also describes in charming fashion the countryside through which their trains passed. Little more than 100 years have gone by in the interim, yet the changes have been so great that the earlier description seems that of some far off country rather than our Main Line section of a century ago. Written in an informal, almost conversational style, the article states that “the country through which we have passed is thickly settled, dotted with neat farmhouses and barns, and all sorts of comfortable outhouses for pigs and poultry, sheep, cattle and horses. The large fields of grain and grass which greet one’s eyes in the summer season, the herds of cattle, and flocks of sheep everywhere to be seen, indicate great agricultural thrift in the inhabitants of Delaware, Montgomery and Chester counties, through which we have been passing. “The small white-washed stone houses which we may observe at a short distance from the dwelling, are generally situated under outspreading branches of some ancient oak or willow, with a crystal brook stealing away through the luxuriant grass. We may observe the patient cows standing around with their white udders swollen with milk, waiting to yield it to the milkmaid’s pail, from which it is poured into earthen or tin pails, and those are placed in the clear cool water of the spring-houses where the rich cream is formed for the butter. Those of us who travel west along the Lancaster pike in our automobiles nowadays are familiar with the beauty of the scene that stretches for miles before our eyes, soon after we pass Paoli, “the celebrated Chester county limestone valley” as it is called in our booklet. Because of the quaint wording of that description given, the writer feels that it should be quoted just as it was written. Few, if any of our readers have failed to feel the breathtaking, yet homey beauty of the valley extending as it does “easterly and westerly some 20 miles in length and averaging two miles in width. It is skirted on both sides with high hills covered with timber, from which issue innumerable springs of pure water, converted into perpetual fountains in the valley, and affording a never-failing supply for man and beast at the home and barn. As the railroad cars descend the hill, on an easy grade, the passengers may take in at one view many miles of this magnificent panorama, interspersed with comfortable and neat farmhouses, spacious barns, and other necessary buildings. Hundreds of fields of waving grain, the deep green corn and luxuriant timothy and clover, pass in review before him. This was the beautiful and fertile country-side of our Main Line a century and more ago. 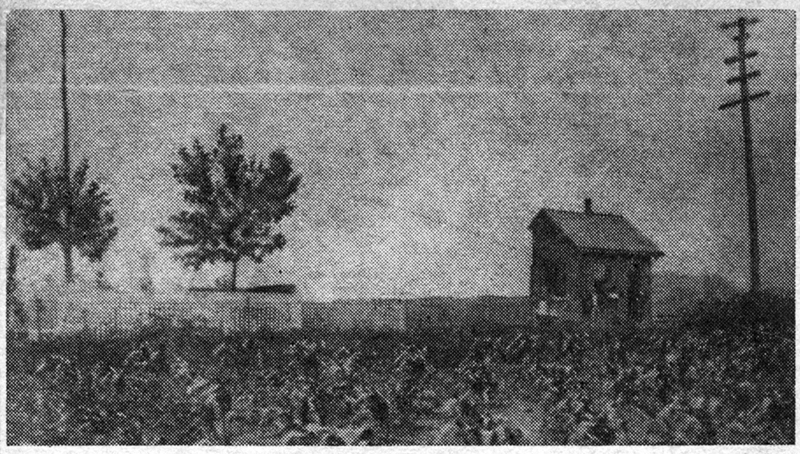 Wayne Railroad Station, with surrounding cornfield, in the 1860’s. Two weeks ago, in “Your Town and My Town” we quoted from a quaint little book, published in 1855, concerning the early days of the Pennsylvania Railroad. We had taken our readers from the old depot, located on the Delaware River at the foot of Market street, past Hestonville, Libertyville and Athensville, to White Hall, ten miles from the city. Mr. Herbert S. Casey, who lent this writer this old “Guide for the Pennsylvania Railroad,” explains that Hestonville was a little village near what is now 52d street, in Philadelphia. His grandfather, Francis Cope Yarnall, was much interested in the well-known little Episcopalian Church in this section. Libertyville is our present suburb of Narberth, while Athensville later became Ardmore. Athens avenue still commemorates the old name. White Hall, later became Bryn Mawr, although the location of the railroad station was considerably changed from its original site near the present Bryn Mawr College. In order to clarify this description, written more than 100 years ago, the present writer adds the following facts: First of all, Villanova retains its original name, while Morgan’s Corner has now become Radnor. In regard to the name of “The Eagle,” now Strafford, the writer obtained much authentic information from the late Mrs. Charles Carroll Suffren, one of the oldest residents of the section, who died this month just before her 99th birthday. Wayne is not on the 1855 map. It may have been a little later that trains began to stop to take on milk at the Cleaver Farm, later known as the William Wood property and now a nursing home located on East Lancaster avenue. The milk stop was called “Cleaver’s Gate” or “Cleaver’s Landing.” Later this became Louella and then Wayne. The first station was a large, square wooden pillar laid on its side, where passengers sat while they waited to flag the train. An old wagon bed, which took the place of this pillar, was burned one Fourth of July. Then a small box-like station was built with a house attached, in which the ticket agent lived. J. Henry Askin, one of Wayne’s pioneers, of whom much has been written in this column, is said to have had a private waiting room in this station for his family. Until a short time ago, this old frame station, which had been enlarged from time to time, stood to the rear of the Wayne Hotel, now the church house of the Wayne Presbyterian Church. And since the Pennsylvania Railroad, in spite of the continuously increasing number of automobiles on the highways, still forms a vital link of transportation between the Main Line and Philadelphia, it seems timely to repeat in “Your Town and My Town,” some of the facts of its early history, just as it has seemed timely in recent columns to do so with the early history of the Main Line itself. The map is indeed an extensive one – its pages, too frail for this writer to dare unfold many times, measuring two yards in length, covering the railroad route from Philadelphia to Pittsburgh. Going back as it does to a period now more than one hundred years past, those entire two yards are of great interest to the historian. Of particular interest to the writer and to her readers, however, are the first few inches of the map, which include that part of the railroad between Philadelphia and Paoli. Even 100 years ago, the Pennsylvania Railroad was recognized as an almost indispensable link between the “eastern or Atlantic cities and those situated on the Ohio and the Mississippi Rivers.” Back in the 1830’s, there seemed some doubt, however, whether the Allegheny Mountains could be passed on a direct route to Pittsburgh, without an inclined plane. In 1838, the first survey was made by William E. Morris, an engineer, while in 1841 Charles L. Schlatter was appointed by the Board of Canal Commissioners to make a full survey for a railway from Harrisburg to Pittsburgh. At this meeting, Mr. Cope was chosen president. He was the great-great-grandfather of Mr. Casey, a well-known citizen of Radnor township, a close friend of Stephen Girard and one of the executors of the latter’s famous will. Mr. Cope was one of three brothers who organized the group of packet ships between England and America. As soon as the act to incorporate the Pennsylvania Railroad was passed on April 13, 1846, a large town meeting was called in Philadelphia, for the purpose of taking measures to bring the corporation into existence. A specially appointed committee prepared an address to be issued in pamphlet form. Private and corporate subscriptions soon rose to a total of $2½ million. From this meeting in April, construction of the road was authorized and begun with a charter bearing the date of April 13, 1846. By the time the first “Guide” was published in 1855, the line of the road between Philadelphia and Pittsburgh was complete. At that time it had three owners, the Commonwealth of Pennsylvania holding that part extending from the city to Dillersville, one mile above Lancaster, consisting of a double track some 69 miles long; from Dillersville to Harrisburg, the Portsmouth, Mount Joy and Lancaster Railroad held a distance of 36 miles, and the remaining 248 miles between Harrisburg and Pittsburgh was owned by the Pennsylvania Railroad. On the way of life in the 60’s in the Philadelphia suburban area, Mr. Townsend, in his book, “The Old Main Line,” gives us many brief, but telling insights. Food, though plentiful then as now, did not have the wide variety that greater transportation facilities and increased refrigeration have made possible. Mr. Townsend writes in nostalgic vein of the delicacies prepared by Augustine, the great Philadelphia colored caterer. He tells of a trip on a Pennsylvania Railroad private car which “was stocked as usual with Augustine’s viands… a noted Englishman, who had just landed to visit the centennial exposition of ’76 was one of the party that sat down to the first luncheon in the little dining room of that car… One delicacy after another tickled his Anglican palate as never before, and turning around, he whispered, ‘If this is what you Americans have on a railway car, I wonder what you have at home.’ ” Mr. Townsend adds, “We did not tell him that we did not always have Augustine at home.” However, regular dining cars were an unknown quantity in the ’60’s and ’70’s. On a trip of any length passengers dined at railway restaurants along the route.